TheAtlas Remote Control has a unique feature that allows you to sequentially turn up to five of your home entertainment devices on or odd with a single key press. NOTE: MASTER POWER(PWR) only works in the CBL mode. If it is not programmed, only the cable converter will turn on or off. In any other mode, pressing MASTER POWER (PWR) once will turn the selected device on or off..
Press and hold SETUP until the last-selected device key blinks twice. Enter 9 9 5 . The last-selected device key blinks twice. For the first device you want in the power on sequence, press a device key (e.g. CBL) once. For the second device in the power sequence, press its key once (e.g. TV). Then press PWR . Repeat steps 4 and 5 up to four more times to add the second, third, fourth and fifth device, as desired. To save the settings and exit the program, press CBL once. Press PWR once to sequentially turn the programmed home entertainment devices on or off. On the remote control, press and hold SETUP until the last-selected device key blinks twice. Press and release PWR . The Titan universal remote control comes pre-programmed to operate the set-top box. In addition, Titan can be programmed to control up to four (4) additional home theater equipment devices. Follow the steps below to program your remote to control other devices. First we will need to find the Manufacturer's Code for your device before programming your remote. Go to http://www.urcsupport.com/html.php?page_id=84 to search for your code. Follow the steps below. Next, type in the brand name of the device under "Brand". The model number isn't required. Most brands use the same code on all models. You will now be given a code for your device. We will need this code in the next set of steps to program that device to your remote. NOTE: Some brands may give more than one code. You can try entering your model number in "Model" if you have it. If not, we can try each code separately in the remote to find the one that works. Turn on all of the devices that you wish to control. On the remote control, press the mode key that you wish to program once (TV, VCR, CABLE, etc. ); it blinks once. Press and hold SETUP until the mode LED blinks twice. Enter the four-digit code for your device that we found in the previous set of steps. If performed correctly, the mode LED blinks twice. NOTE: If the selected mode LED emits a long blink, the entry is invalid. Repeat steps 2 through 4 and try entering the same code again. Aim the remote control at the device and press POWER once. The device should turn off. If it does not, repeat steps 2 through 3, trying each code for your brand until you find one that works. The device selection buttons tell your remote whether you want to control your set top box or your television. To turn your TV on or off, press the TV button then the POWER button. To turn your set top box on or off, press the CBL button and then the POWER button. Note: It is not necessary to turn your set top box off. 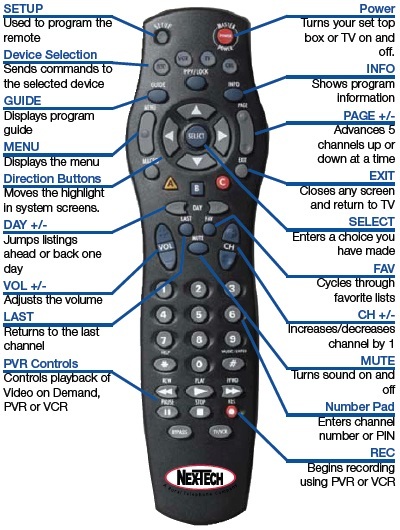 Note: Your remote control must have the remote code programmed in before it can send the correct signals for your TV. 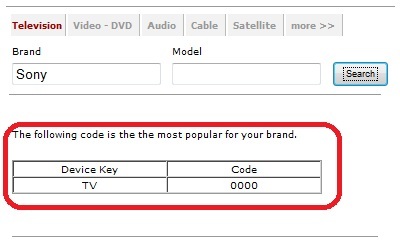 If the list of TV brand codes was not included in your installation pack, please contact customer service. If pressing POWER turned the wrong device on or off, press the POWER button again, press the appropriate device selection button (AUD, VCR, TV or CBL) and press POWER once more. GUIDE will display Guide so you can find a program you like. If the program is on now, you tune to the channel showing it. If not, you can set a scheduled event to remind you when it does come on. If your set top box supports recording, you can schedule a recording for the program. MENU displays the Menubar when in cable [CBL] mode, and in [TV] mode you will see your TV’s menu. The Menubar provides quick access to every feature supported by your service. INFO displays the Infobar, a feature that lets you see information on what you’re watching, what’s coming on next, and what’s on other channels. EXIT causes your set top box to exit whatever screen you are seeing and return you to normal TV viewing. If you ever get lost on a screen, it is always safe to press EXIT and then start over. Posted - Tue, Jun 21, 2011 at 9:43 PM. This article has been viewed 54545 times.